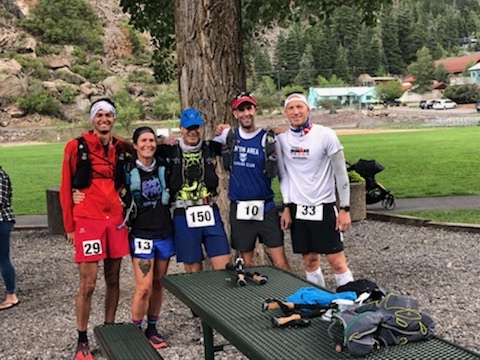 It’s been a long hiatus, but I’m going to throw my hat back into the blogging ring with a report of my attempt at the 50 mile run at Ouray 100 and 50 Mile Endurance Runs. I went into this race as strong as was possible. I chose this race while my hands were tied with broken arm/Boston training, plus I already had a 50 miler planned one month after Boston. I know I give my coach a really big headache with the way I schedule races. Being prepared for a 50 miler a month after marathon training seemed really doable when I registered for it. 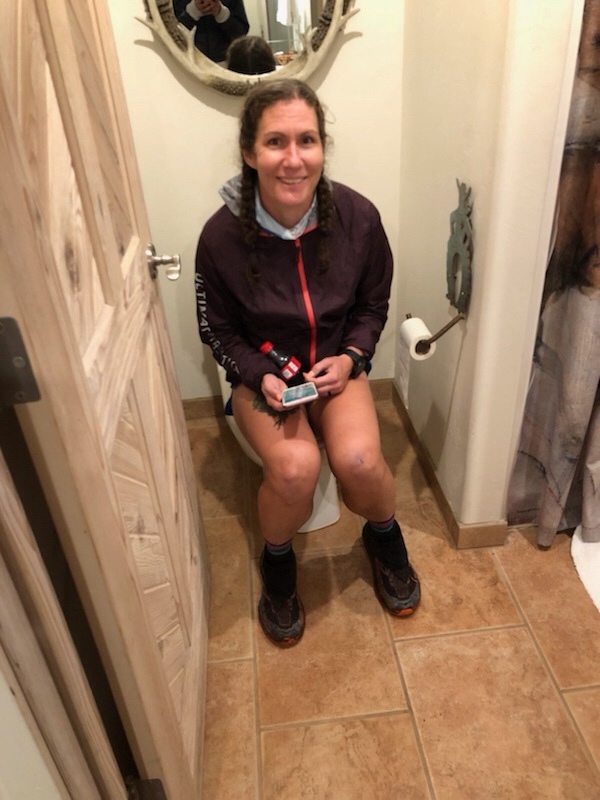 Preparing for the most ridiculously hard mountain race (my first mountain race, mind you), which was a mere TWO MONTHS after running a 50 miler in Texas also seemed very doable at the time. Apparently I have some sort of dissociation complex, in which I can’t process the negatives associated with the way I pick races. Once the 50 miler in Texas was done, I started training for climbing. Reality set in and I quickly realized that I had gotten myself in wayyyyyy over my head. 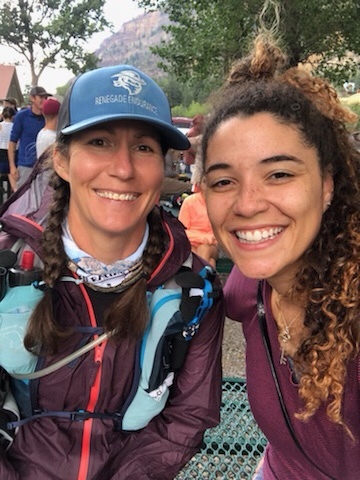 I contacted the RD of Ouray well before Boston to see if he would accept my finish at Brazos Bend 100 as my qualifier for this race – he basically said that if I was brave enough to register, that I was welcome! I still waited for quite some time to register because the family couldn’t come with and I was anxious about driving alone. In the end that was wasted energy because Kolbe volunteered to come with me! We had a great time travelling (I did, at least) and I appreciated her coming along for the ride. Highlight of the drive to Ouray was stopping in Silverton to find THE Hardrock! I was as nervous as a cat on a hot tin roof during the drive up to Ouray. I told Kolbe that I felt I was driving myself to my own execution. I had a pretty good understanding of what I would be facing and also understood that there was no way to replicate those climbs in my area of Texas. 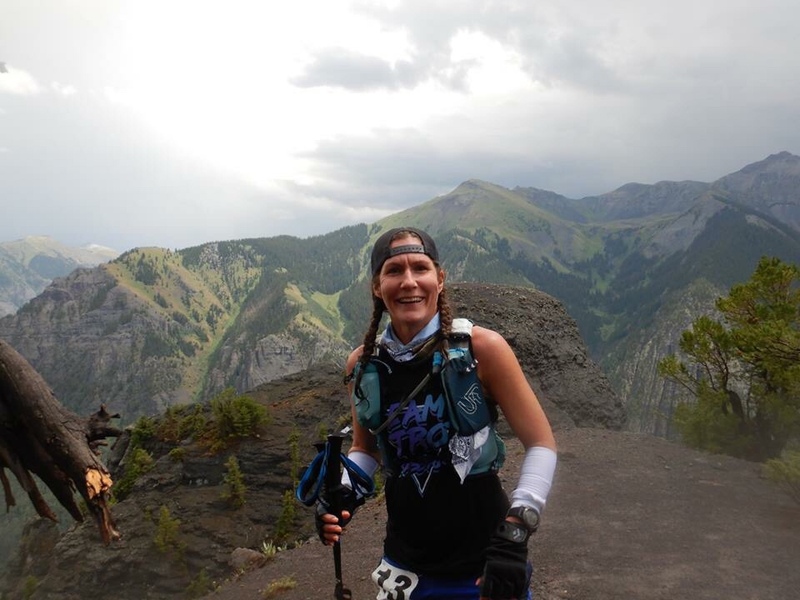 I realized that a finish was likely out of my reach – I just wanted to race in the San Juans and see what I could accomplish. 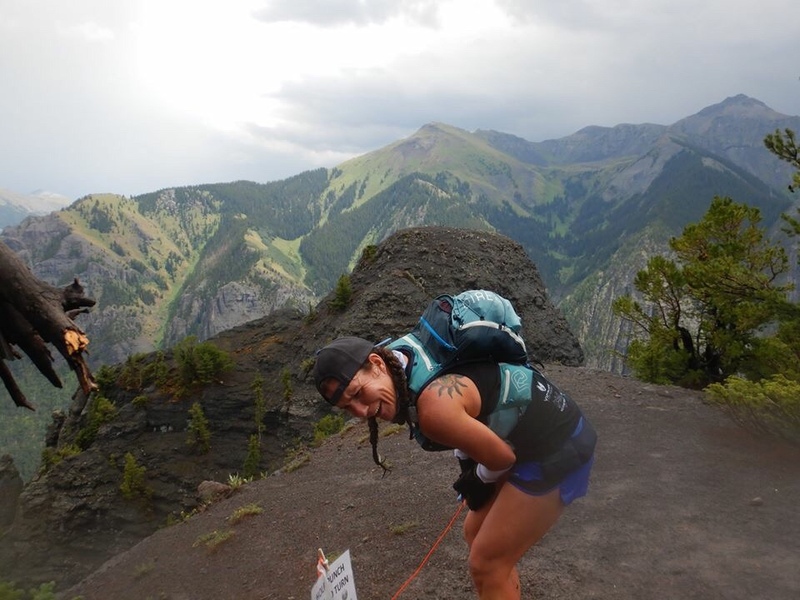 We arrived in Ouray on Thursday afternoon and went immediately to pick up my bib. Suddenly, a wave of calm rushed over me (even though I had been given “lucky” bib #13). It’s hard to feel nervous when you stand in that valley and see the majesty of those mountains ALL around you. Friday, Kolbe and I “attempted” a hike on the Ouray Perimeter Trail, but we ended up on a closed section where I had to literally use my hands not to slide down the side of the mountain. I finally admitted that we had somehow gone off the maintained trail, we backtracked and found the location where we missed the turn to stay on the actual trail. I chose to see this as my one wrong turn while in Ouray, rather than to see it as a foreboding of difficulties ahead. 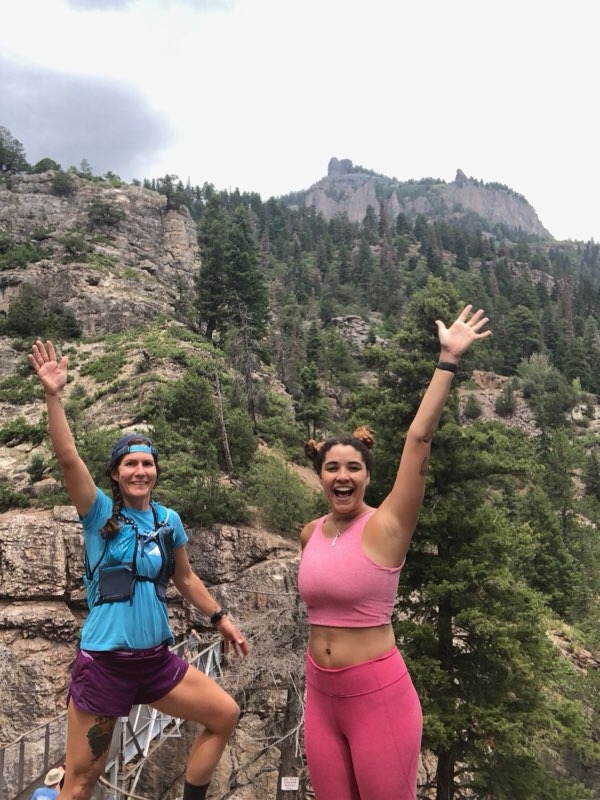 We had planned this hike around Ouray to include visiting Box Canyon, but after taking the wrong trail, decided to drive there instead. Our breath was taken away by the visit to Box Canyon, where we witnessed a waterfall within the mountain. 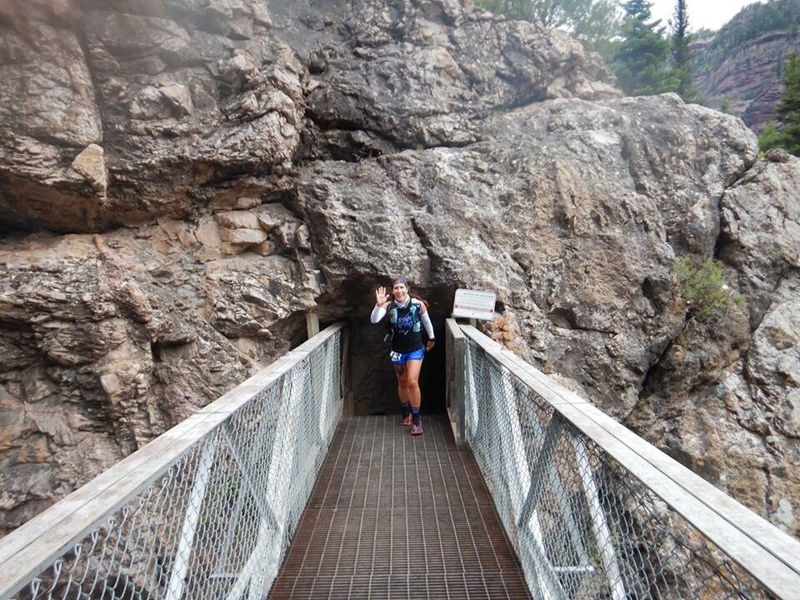 I was also able to walk through the tunnel and down the stairs that would take me out of Ouray on the first section of the 50 miler. We were planning to rent a Jeep and explore some of the Jeep roads that would take me to the trails during the race, but it rained all afternoon and neither of us felt like driving around in the rain. I used this time to re-organize all my gear and get things race ready. The rains finally moved out for good (for Friday, anyway) and after dinner we soaked in the Hot Springs. My legs enjoyed that and it set me up for a really good sleep. Saturday morning, I was up early as usual even though the race didn’t start until noon. I was surprisingly calm – I was just ready to get out there and experience all the race had to throw at me. We went for breakfast at a coffee shop we had found the day before and enjoyed coffee and bagels and more coffee. When we got back to the hotel, the antsy started setting in. I couldn’t stay busy enough. It was impossible to sit still, but I really didn’t have anything to do. 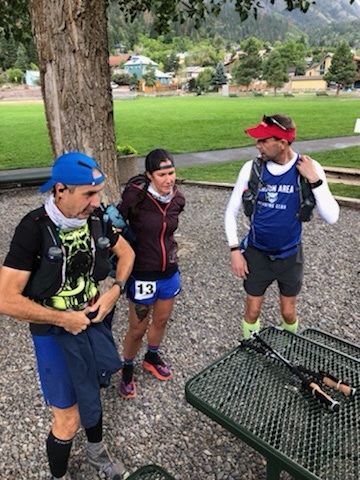 We decided to head to Fellin Park around 10 and just hung around, chatting with others, until it was time for the race to begin. North Texas had a good showing – there were 3 guys from Dallas Dirt Runners there, as well as myself. We had set up our own little Facebook group to compare training and share info. I registered for this race thinking that I would be going alone, but it was so nice to be able to share with others from my area. I also met a guy at my motel from Ft Worth that ran the 100 and we met yet another Texan while waiting on the race to start. While we were waiting for those final moments to tick away, Mother Nature reminded us who was boss with a quick rain and hail storm. I had <seriously> joked that I would not be happy unless I was hailed upon during the race, so check that box off the list. I was also able to use the little stash of duct tape that I had in my pack to secure my SPOT tracker, so I was pretty pumped about that as well. It clearly doesn’t take much to make me happy. Before we knew it, RD was counting down and off we went. We hit the Perimeter Trail, up the stairs, through the tunnel, then onto the Jeep roads that would eventually take us to the Weehawken aid station. That first little section was mostly on Jeep roads, but still clocked 1300′ in ascent and Mother Nature unloaded on us with pouring rain. The next section up Weehawken Pack Trail to the Alpine Mine Overlook was up the side of a mountain on beautiful single track. Mother Nature still had quite a bit in store for us and we were rained and hailed on again. I laughed like a 5 year old – I had so much fun!!! And while the hail stung a bit, it was so small that it didn’t cause an issue. I didn’t even bother getting my jacket out. I did attempt to record with my phone, but my hands were wet so I aborted that attempt quickly. The DDR boys were a bit ahead of me, but I was still happy with my climbing at this point. I reached the overlook just as they were about to head back down. Bryan was kind enough to snap a couple of photos of me and we all began the descent together. The sun was shining now and it was actually a little warm (I secretly wished for another downpour – I would later get my wish). We didn’t want to blow our quads on the first descent, so we made our way down quickly, but didn’t bomb down the mountain. The trails were also wet and slippery in places and I actually slid off the trail once. We made it back to Weehawken AS, quickly refilled water, ate and moved onto the next section. One of the volunteers told us the next section was a “burly” climb. I appreciated the honesty. We had clocked about 2360′ of vertical ascent in this section and were up to a rough total of 3,680. Coming out of the tunnel to cross the bridge at Box Canyon. Ended up with a hanging chad. To get to the next section, we had to go back down the Jeep road that had brought us to Weehawken (DOWN!!! ), then we would take a right onto another Jeep road that was somehow more steep than the one we were on. After what seemed like an eternity, I finally made it to the trail head. It was raining….again and hailing…again. Honestly, the weather didn’t bother me. I kind of liked it. It kept me cool (still hadn’t put a jacket on). This section was…..tough. We left Weehawken 25 min ahead off the cutoff, which meant I had about 3 hours and 30 minutes to get out to Crystal Lake and back to Fellin Park. Only 7.1 miles. As soon as I started climbing, I knew I would be cutting it close. 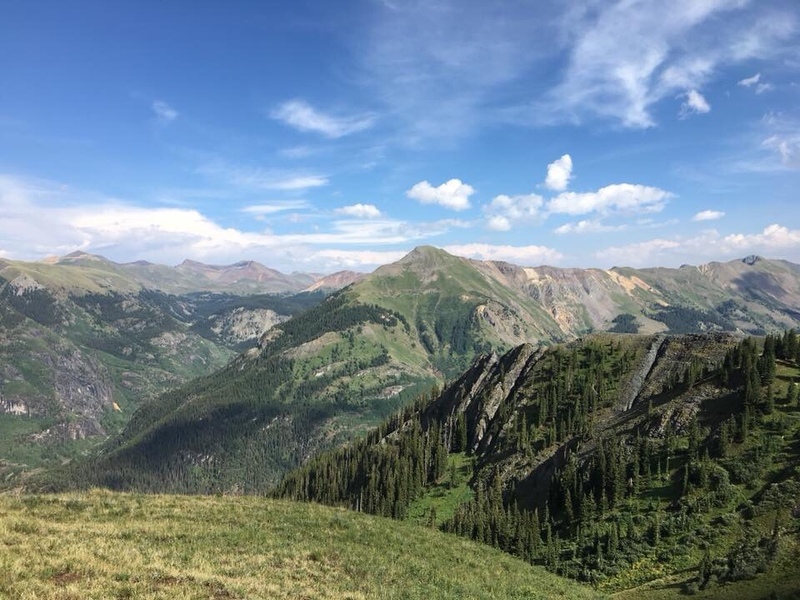 The trail was roughly 2.2 miles to Hayden Pass with 3600′ gain. Which sounds totally doable, right? I was moving so slow. The climb was relentless – there was never really a break in going UP. Even the switch backs – take a turn and you’re still going UP. I am sure altitude played a role in my energy level, but the main contributor was that I just wasn’t fueling. I had my poles out and it was a real hassle to get the gel out, get the baggie for trash out and manage the poles while I was doing all this. Plus, so much of this was on the side of the mountain. I waited (foolishly) to fuel until I made it to a section that wasn’t as exposed. By this time I was behind on fueling yet I continued to take only one gel at a time. I kept thinking that I had to be nearing Hayden Pass. One of the 100 mile runners came down and I asked her if I was getting close. I love truthful people. She said, “No. Sorry. You’re going to keep going up. Then down just a bit. Then up some more.” I felt like I would never get to the pass! When I did, I knew I was falling behind on time, but part of this journey was about the experience. I took a minute to soak in the beauty of the view and snap a pic. Then I was on my way again. After the pass, there was a relatively flat section that cut across the mountain – my best guess is that it was about a mile long. It was above the tree line so the views were amazing. I knew that I just needed to get across to start my descent into Crystal Lake, but at this point I was getting dangerously close to the cutoffs. I finally made it across and started the descent. I was moving as quickly as possible, but also cautiously because the trails were still a bit wet. I passed several runners making their way back up and they all felt I had time to make the cutoff. I wasn’t convinced, but I had to give it my all. I met the DDR boys and Bryan told me to “run like the Devil was chasing me.” I continued as quickly as possible, but was slowed due to a more technical section. DAMN. 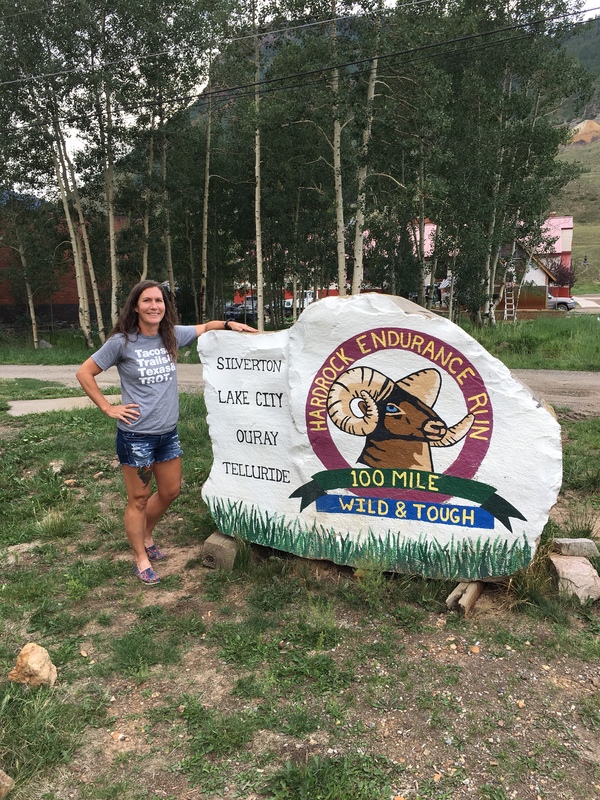 I made it to the bottom, but the aid station was near the parking area for Crystal Lake – I ran as fast as my legs would take me, but I knew I had missed the cutoff…by FIVE MINUTES. When I came into the AS, the volunteers asked what I needed. I said, “I missed the cutoff.” They told me the cutoffs were “soft” and that I looked really good, so they would let me continue. I got tears in my eyes and nearly started crying. I DID NOT want my race to end at Crystal Lake. I knew that, realistically, getting back to Fellin before the cutoff would take everything I had – and then some – but for some reason, my mind felt that getting halfway before a drop would make it more palette-able. Bryan’s wife, Shellene, was a God-send. She had waited there for me and refilled my bladder while I was digging out a long sleeve shirt, stuffing more gels in my pockets and eating. I was in and out of that aid station in less than 5 minutes. I couldn’t have done it without Shellene!! Now I had the pleasure of climbing BACK up to Hayden Pass. As I made my way past the trail head, Mother Nature opened up the skies again and dumped more pouring rain and hail down on me. I went just a little way before I decided to get out my jacket. I had just put on this dry long sleeve shirt and I knew that the mile across the top of the mountain would be cold. It was windy up there and the sun was starting to set – wet clothes wouldn’t make that any easier. Onward and upward I went, maybe just a tad faster than my ascent from the other side of the mountain, but not much. 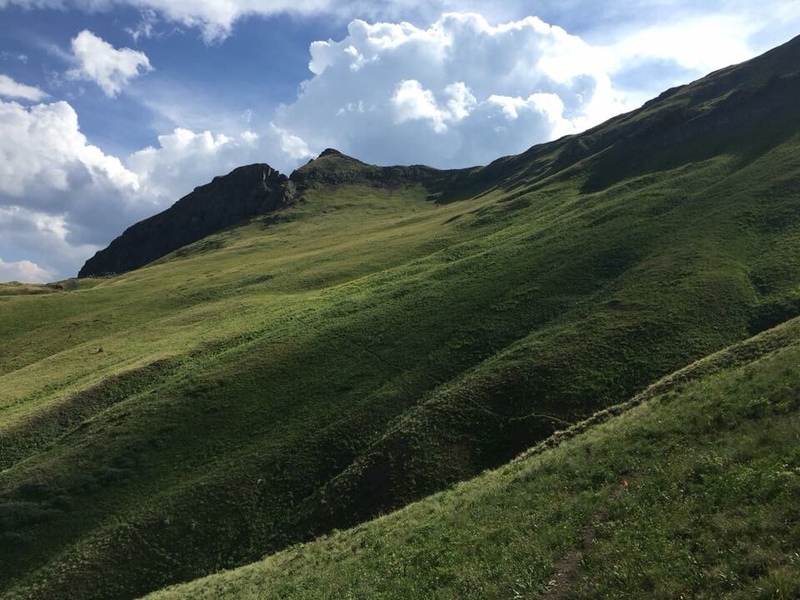 Luckily, the way back was a shorter ascent with only 2,600′ gain. I made it to the top, crept across the mountain and was elated to finally be back at the pass and ready to go DOWN. The elation was short-lived, though, as I soon discovered that the trail was now a muddy slip-n-slide after the day of rain – in many places the trail served as the avenue for the rain water runoff. I’m not the best at sliding down slopes (without skis, anyway), so this section was painfully slow. The glimmer of hope that I had of making it to Fellin before the cutoff was quickly snuffed out. My lack of fueling was also beginning to catch up to me in a bad way. I knew that I needed to eat, but, but, but….. This last section was the darkest part of the race, for me. I felt pretty defeated. I was exhausted. I could tell that mentally I was starting to drift. I just wanted to get back to Fellin Park. The great thing about mountain races is that no one is coming to save you. You can’t take any shortcuts down. I had to see it through. I reminded myself to keep putting one foot in front of the other. As slow as it was, I just had to keep moving. I also had to pee ALL THE TIME, like I did during the night at Brazos. Still haven’t figured out if this is how my body reacts to the cold, or if I was low on sodium. I stopped to take an Oral IV, but had to pee AGAIN not long after. At one point, I thought I was off course. The trail looked different in the dark and I think the runoff made it look different as well. I was able to use the Gaia app that I had downloaded and could see that I was still on course. (I continued on and found a flag just steps later.) It was at this point that I also realized that I was still a very long way from Fellin. I decided to try to text Kolbe – weird thing is that I had better service on the side of the mountain than in Ouray! It was around 10pm and I told Kolbe I hoped to be there by 11, but clearly would miss the 10:10 cutoff. As luck would have it, I was much closer to the trail head than I realized. I was so excited to be back on the Jeep roads. I ran as quickly as I could, but those little roads seemed to go on forever! 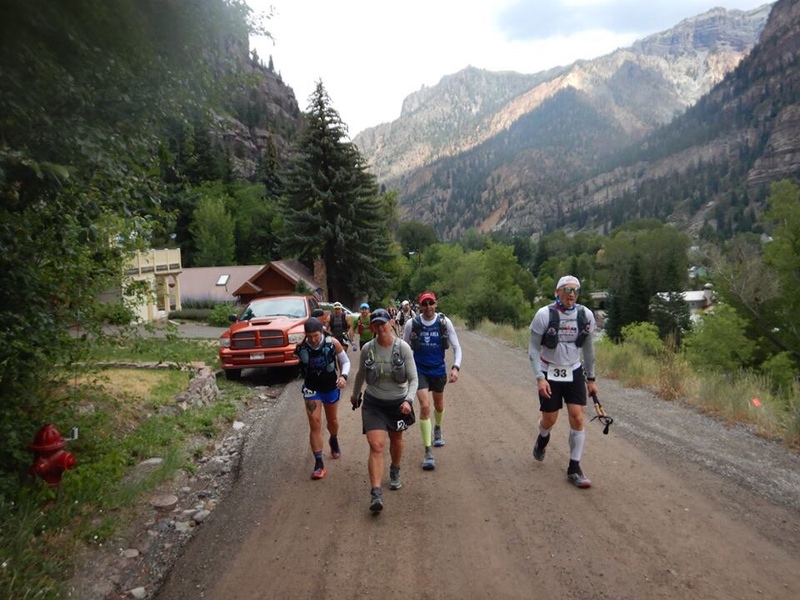 After what seemed like an eternity, I was back on Camp Bird Road, which would take me to the Ouray Perimeter Trail and then back to the streets of Ouray to Fellin Park. That last stretch of road to Fellin Park seemed never ending. Then I missed the turn to go over the bridge to get back to Fellin. Luckily, some people were out walking and asked where I was going. They told me I had overshot the turn by about 1/4 mile. (GREAT) One of the ladies in the party ran me back to the turn (God bless her!). She told me that she had attempted the 100 for the 4th year in a row and DNF’d for the 4th year in a row. Getting back to Fellin was a mixed bag of emotions. I knew I was too late to continue but I was glad that the suffering was finally ending. If I had been given the opportunity to go back out, I’m quite certain I would have declined. That bothered me initially, but some time and perspective has allowed me to decide to use that as fuel for next time. In the end, I climbed around 9,900′ – not nearly as much as I had hoped but much more than my legs have ever handled at one time! I was so muddy. Kolbe was bringing stuff in from the car. I didn’t know what to do or where to sit…..so I sat on the toilet. LOL!! In the end, I’m pretty happy with it. I was able to get halfway through this beast with 2 months of dedicated training (not bad for a flatlander from Texas! ), so clearly the training that I did paid off. I was so worried about my quads, but they felt so strong even though they dealt with more descent ever before. My mental game was decent. The only thing that really got to me was the climbs. I felt defeated and was angry that those climbs were so slow. I realize now that some of this was altitude but a very large part was TERRIBLE fueling. Terrible fueling isn’t new for me – it has been an ongoing problem for me in races and training. Special shout out to my coach, Greg, for encouraging me to take on this challenge and getting me as ready as humanly possible!!! There will be a next time – I’m already planning to go back!! But for 2019, I’m going to train more than 2 months and see how far I can go!